"Hey, Let's go to the Beach!" Well, that is our theme this month at Blank Page Muse. 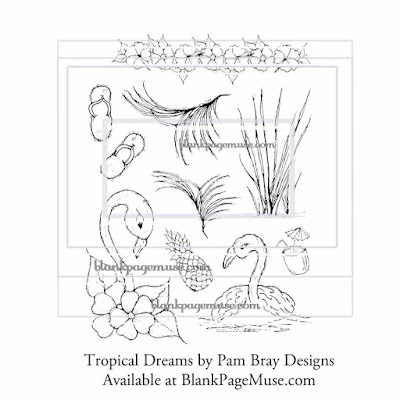 So here is what I came up with using the new stamp set called Flamingo Dream I love those little flip flops. They are so useful for all things "Summer." Wouldn't they be perfect on a scrapbook layout??? Here is my card, "Kick Back It's Summer"
Come checkout the Blank Page Muse Creative Challenge. This month's theme is "Let's go to the Beach." Create a new project following the theme and add it via the Inlinkz linky tool. There will be a random drawing prize for a Blank Page Muse Gift Certificate. You can find all the guidelines HERE.